1. HobbyModelKorea are advertising two 1:35 Apache kits from Kangnam, one an AH-64A, the other an AH-64D Longbow. The only other Apache in this scale is the Dragon Longbow #4530, but I don't know whether the Kangnam kits are derived from this. 2. Trumpeter are planning to release a 1:48 Harbin Z-9G (licence-built Dauphin) in December, along with a 1:48 Mi-24 Hind-D.
3. Mach 2 have re-issued their 1:72 Sikorsky S-51 #1172. 4. Unicraft have re-issued their 1:144 resin Fa.284 Flying Crane. 5. Luchtvaart are listing a 1:72 Westland Lynx HMA.8 with Royal Navy markings. The manufacturer code given by Luchtvaart is 'PLA' which I assume is ZTS Plastyk (of Poland). I would appreciate any information about this daring attempt to upstage the imminent Airfix release. 6. Eduard are planning to release a set of canopy and wheel paint masks for the 1:48 Hasegawa Sea King kits. 7. There are strange tales circulating at Westlands concerning the forthcoming Italeri and Revell 1:72 Merlins. The word is that contrary to what we originally thought, these will be entirely different kits, sharing nothing except their subject. I also hear that while Westlands have been able to give Revell a lot of help with their HC.3, Italeri have been struggling in their relationship with Lockheed Martin, the prime contractor on the HAS.1. Furthermore, in 2002 we are to expect an Italian Navy EH.101 from Italeri, and a CH-149 Cormorant from Revell. Lastly, it seems that the 1:72 Revell Sea King HAS.6 is almost complete, and will include parts to build a Sea King AEW.7. Remember that all this is just rumour, though from normally reliable sources! 8. The 1:48 Belcher resin Army Lynx (see HKN #110) will be available in mid-July. 9. The Two Bobs Aviation Graphics 1:48 AH-1S decals are now available, #48005. 10. In HKN #124 I wrote "Aerocalcas Argentina have issued decal sheet #72010 for the Sea King". However, further investigation has shown that subject of the decal sheet is in fact 'Seaking Tracker S2F/S2'. If anyone can clarify whether there is actually a Sea King on the sheet along with the Grumman S2, I'd like to hear from them. Aerocalcas have now also issued sheet #72011 which includes markings for the Argentine Air Force (Vertol Model 308) Chinook. 11. 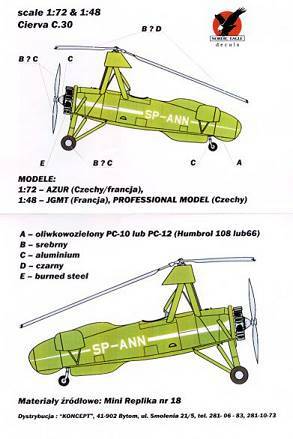 Nordic Eagle have released a set of decals for the Cierva C.30 with the Polish registration SP-ANN. 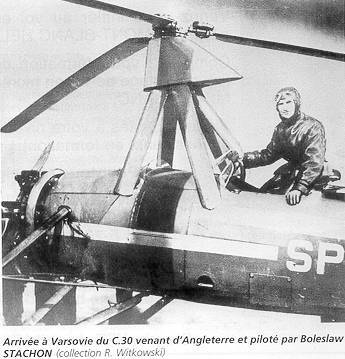 This aircraft, c/n 745, was delivered to the Polish Air Force in December 1934 and destroyed by the Germans in 1939. 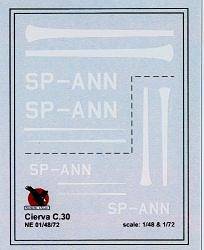 The decal sheet has markings in both 1:48 and 1:72, and is available from Jadar. 12. Also from Poland is a new book PZL-Swidnik S.A. - the Story, a 135 page hard-back with text in both Polish and English. The first chapter covers the history of the PZL plant from their earliest days up to the present day This is followed by descriptions of the SM-1, SM-2, SM-4, Mi-2, W-3, SW-4 and IS-2 helicopters, the I-23 aeroplane, and the PW-5 & PW-6 gliders. Lastly there is a section about their co-operation with other companies such as Agusta. As well as many monochrome photos there are also 16 pages in colour. This is available from Pelta. 13. 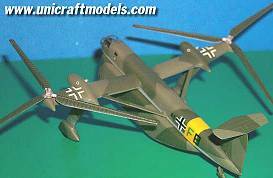 The June issue of Scale Aircraft Modelling features the H-46 / KV-107, and includes 31 colour profiles. There is also an AB205 update including a set of plans to go with the article in the May issue, and some pictures of an IDF/AF Apache in experimental green & sand camoflage. 14. Roll Models have a nice review of the 1:72 Italeri H-34 Sea Horse which includes photos and details of Tony Morgan's tasty orange USMC H-34. 15. If you happen to be in the vicinity of the Hiller Museum at San Carlos in California this coming Saturday there's an event you cannot afford to miss - Vertical Challenge 2001. This promises to feature a mouth-watering selection of both civil and military helicopters, as well as numerous other attractions. Thanks to Pawel Okulski, Tony Morgan, Brent Theobald, Drewe Manton, Bill Faulkner, and David Nilson.